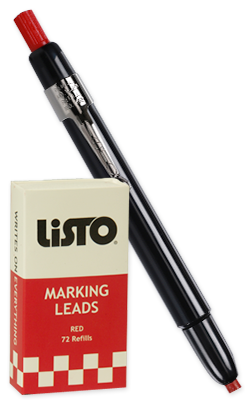 For nearly 100 years, Listo has been America’s best-selling mechanical marking pencil. Our pencils feature strong, thick wax based lead for big, bold markings. They write on metal, wood, glass, concrete, plastic, paper, frozen goods, styrofoam – almost any surface imaginable. The markings wipe off easily from non-porous surfaces with cloth and gentle household cleanser. Listo mechanical pencils are used in many environments - industrial, food & beverage service, office supply, construction & auto industries, to name a few. Our wax pencils are non-toxic in normal everyday use and are environmentally safe. Just as we did 100 years ago - we proudly hand make each and every mechanical pencil and carton cutter here in the USA. Call today or shop here to purchase your mechanical marking pencils and carton cutters. Listo Pencil Company was founded in 1921 in Alameda, CA by Charles Wehn. Charles was an early adopter of plastics as an industrial material expert. He designed and built some of the earliest mechanical writing instruments in the industry. Today Listo Pencil continues to grow under Charle's great grandson, 4th generation Rick Stuart's, dedicated leadership.